Lauriston House is a heritage-listed property in Dundas Valley, built around 1887. It is an example of a Victorian Italianate villa found in the area, and was owned by Alexander Eyles, a fruit grower, until his death in 1921. These days it is used as a romantic wedding venue and charming function centre. We recently had the privilege of celebrating a relative's wedding here and we had a really positive experience. The house can cater for a maximum of 200 people (sit-down dinner), and from the moment we stepped inside, the house really had that "wow" factor. A beautiful fountain greets you as you walk in through the gates, and behind it there is a cherry blossom tree-lined pathway for the wedding procession leading up to a wrought iron gazebo. As it is still winter there are no flowers on the trees, but I can only imagine how much more breathtaking this scene would be in the middle of spring. Walking towards the house there is a cute little verandah with cast iron lacework on it typical of houses built in the Victorian era. When you walk through the colourful stained glass doors, you are greeted by a warm functioning fireplace and an elaborate glass chandelier overhead. This is the waiting room and there are plush chairs to sit on (although not enough) for guests whilst they wait for the ceremony or reception to start. To the right of the waiting room there is a lady's bathroom and a powder room next to it. The powder room is pretty and charming, like a woman's boudoir. Even the bathroom looks like an extension of the boudoir, and very homely and luxurious at the same time. To the left of the waiting room is the dining room and dancefloor with more of those beautiful chandeliers and ornate high ceilings. We took as many photos of the chandeliers, fountain and manicured gardens as we took of the bride and groom, wedding party and guests. The MC, who had an incredible singing voice, serenaded the bride and groom as they were introduced as husband and wife (and as they made a grand entrance through the double doors of the dining room); and he also cracked some funny jokes. I liked the MC as he was warm and friendly and really made the proceedings lively. As for the food – it was delicious. We were served various canapes whilst waiting for the reception, such as spring rolls, mini quiches, meatballs, satay chicken sticks, samosas and various delicious vegetarian morsels. Dinner was just as delightful such as creamy pasta and mushroom crepe for entrée, alternate chicken and beef for mains, ice cream and cake for dessert (as well as a serving of the wedding cake) and the standard bread rolls and butter and drinks aplenty. We were very well fed, and I overheard my 4 year old niece say to her mum, "Why are we eating so much food?" At the end of the night, everyone let loose on the dancefloor as the DJ played many of the best contemporary songs as well as good old 90s tunes. We ended up going home very full and tired. The only downside to this venue is that they don't have a dedicated parking lot for patrons so we had to park in the street, but other than that, it was an otherwise great venue. 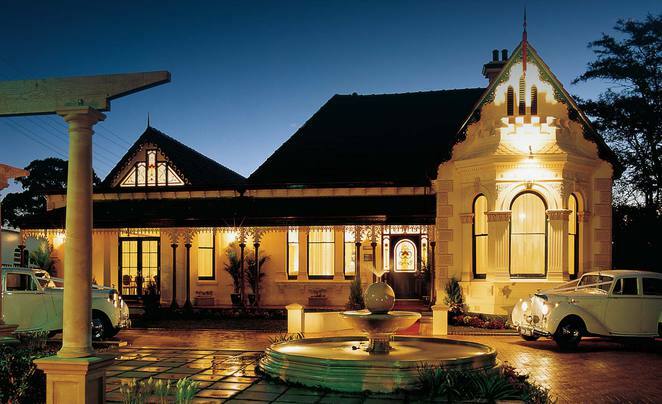 For prices please contact Lauriston House on (02) 9858 3335 or visit their website. the entree looks delicious. Your daughter's question made me laugh.